One ought, every day at least, to hear a little song, read a good poem, and see a fine picture. Men are so inclined to content themselves with what is commonest; the spirit and the senses so easily grow dead to the impressions of the beautiful and perfect; that every one should study, by all methods, to nourish in his mind the faculty of feeling these things. For no man can bear to be entirely deprived of such enjoyments: it is only because they are not accustomed to the taste of what is excellent that the generality of people take delight in silly and insipid things, provided they be new. Setting aside for a moment the possibility of speaking a few reasonable words — a phrase generally omitted from the quotation — the relevance of Serlo’s assertion is undeniable. In a world awash in silly and insipid things, it becomes ever easier for our spirits to become deadened to the beauty and creativity surrounding us: both that contained in past tradition and that which arises from our present lives. Spending hours each day caught up in social media or in activities more habitual than pleasurable, we say we have no time for the difficult, the unfamiliar, or the arcane. And yet, by declining to engage with the wealth of music, literature, and art available to us, we cut ourselves off from the pleasures and possibilities that accompany such engagement. Implicit in Serlo’s musings is the suggestion that the ability to speak “a few reasonable words” is linked to study of the best that surrounds us in arts and literature, in science, in history, and in philosophy. The writer… is careful of what he reads, for that is what he will write. He is careful of what he learns, because that is what he will know. In the world of today’s programmers and computer scientists, the truth is pared down to an even simpler form; the quality of output is determined by the quality of input. In other words: garbage in, garbage out. None of this means that we should reject Homer Simpson in favor of Shakespeare, or Leonard Skynyrd in favor of Leonard Bernstein. A variety of voices have legitimate places in the world, and we are free to honor and enjoy them all. But allowing the worst voices to crowd out the best is short-sighted at best, and soul-deadening at worst. With this in mind, I’ve made three commitments for 2018. Each is based on Serlo’s advice to make room in each day for a little poetry, a bit of music, and the joy of art. 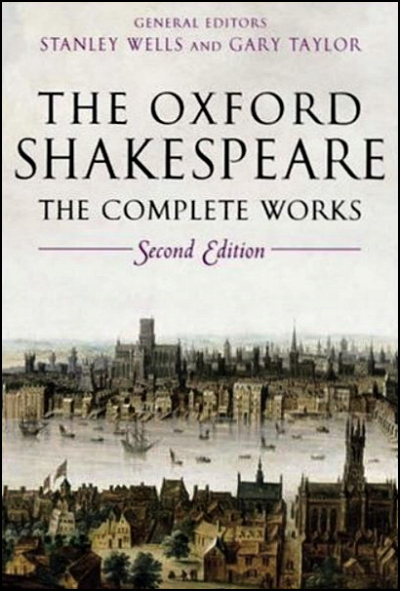 Intrigued by a year-long reading plan that takes participants through the complete works of William Shakespeare, I purchased the Second Edition of The Oxford Shakespeare, and will spend a portion of the first day of 2018 with Two Gentlemen of Verona. As the year unfolds, weekdays will be devoted to the plays; weekends will be reserved for sonnets and other poems. Given the number of photographers and visual artists whose blogs I follow, there isn’t a day that I don’t enjoy at least a few images. Still, the wonder of the internet has made worldwide collections available: Boston’s Museum of Fine Arts, the Louvre, the Guggenheim, the National Gallery of Art, and the British Museum all can be virtually toured. Links to each museum are available here, as well as information about other, smaller sites that can be visited. Obviously, seeing artwork in person rather than on a computer screen is best, but when the best isn’t possible, very good will do. It’s an open question whether I’ll be speaking more reasonably when 2018 is over, but I certainly anticipate having fun with this project, and learning a good bit as well. In the end, who could ask more of a New Year? May yours be fully as rewarding and pleasurable, however you choose to fill up its days. I expect you’ll enjoy the tours through Shakespeare and fine music, and I admire your commitment to them. While that isn’t on my plan for 2018, I do plan to enjoy museums regularly. Jim and I visited many in this past year, of such a wide variety. Perhaps a museum per month isn’t too much to expect. :) Happy new year. I think a museum each month would be a relatively easy goal to achieve. There are several smaller museums in my part of Texas that I’ve not yet visited, not to mention some a little farther afield. While traveling, I’ve often found the smaller museums just as interesting, and sometimes more accessible. I’m sure you’ve had the same experience. Whichever you visit, I’m sure you’ll post your impressions, and I’ll look forward to reading about them. Happy New Year to you and Jim. Yes, we were in several small museums last year, very satisfying experiences. I think large ones can be rather overwhelming. We came *this close* to visiting the Crystal Bridges museum last month. And next time we’re in Chicago I intend to get to the National Museum of Mexican Art. Thanks. I will stop listening to the worst voices. In fact I think I have already. Lol! This all sounds good Linda.. May yours be rewarding as well. Those “worst voices” can be a chore to deal with, can’t they? Sometimes they’re public voices, ranting and raving, and sometimes they’re our own voice, telling us we’re not capable, or strong, or smart. Telling those voices to hush, or turning them off, or ignoring them, can have great value — as you’ve already learned. Here’s to an even better year for us all! I’ve got to come back to read when I’m more wide awake. This waiting for the new year to ring in is for young people. Happy 2018! May you be blessed with reading great passages, listening to good music and seeing beautiful things. I’ve been up at midnight on some recent New Year’s Eves, but it’s not the primary goal it used to be when we were younger. Now I’m far more fond of early mornings on New Year’s day. It’s always quiet, and empty, and seems promise-filled. I confess I didn’t take my traditional walk this morning — being inside and cozy seemed preferable to being outside and cold. Here’s wishing you a year filled with good things — and an early end to winter! Thank you for a very thoughtful and inspiring post. I don’t think I’ll undertake these things as methodically as you outline in your post above, but I will definitely be taking your advice and exposing myself to more beautiful things this year. What you propose dovetails nicely into my own commitment to simplify and minimize. For me that means less TV and social media and more literature, art, and music. Happy New Year! I hope you have an awesome 2018. I smiled when I read about some of your intentions on your blog. I’ve come to think that decluttering our minds is just as important — more important? — than decluttering our living space, our to-do lists, and so on. They’re all related, of course, so no matter where we start, the benefits will accrue in other areas of life. I hope you’re even more satisfied with your writing endeavors at the end of this year. Your instincts are good, so trust them at least as much — or even more — than you trust so-called blogging “experts.” If I’d listened to that crew, I would have given up in the first year. I certainly wouldn’t have had as much fun. Happy New Year to you, too, Biff! I agree wholeheartedly with your wisdom regarding de-cluttering our minds as well as our environment. In our modern age, we are so distracted by electronic gadgets, social media, our jobs, our home lives that we often have very little brain power or attention span left over for the things we enjoy doing (e.g. writing). I plan to start the de-cluttering process on a small scale and then hopefully the snowball will begin rolling down the hill and getting bigger and bigger. And, hopefully too, the snowball itself won’t consume me on the way down. Thank you, too, for your encouragement of my writing. I suppose all writers are a little insecure when it comes to our own writing and so we tend to second guess ourselves too much or rely too much on the advice of experts. Listening to experts is fine, of course, but we shouldn’t let it fundamentally change who we are. I would love to learn more about blogging and increasing my readership … but I would hate to lose my “writer’s voice” in the process. Hopefully, another year here in the WP trenches will hone my skills. This has all the making for a great new year and may it be a good one for you! I have projects galore lined up — some of them leftovers from last year — so we’ll see how it goes. I do like the feeling of a fresh start. Rather than bemoaning the undone, I just reprioritize and start doing again. Maybe this will be the year I really start to understand my camera, and learn photoshop! It is a pleasure to read your wishes for the new year… a little something good, even if we’ve heard bad news; even if we’re pressed by work or chores… to exercise the choices we have, with good intention. Sounds good advice for sure. And let me take advantage of this fine meeting place, to wish all those who bring there light, as they come by for their own delight… may this be a year of unexpected peace and joy and learning too. I suppose there never will be an end to bad news, just as there never will be an end to the demands that life imposes. And yet, in the midst of our complicated lives, one of the most basic choices we can exercise is the choice to refuse the counsel of those who seek to convince us life is limited to bad news and drudgery. That simply isn’t true, even though the good, the beautiful or the true may be hidden for a time. Beyond our intentions, of course, lie those unexpected experiences you speak of: unanticipated moments of peace, a sudden flash of beauty, a kindness wholly unexpected. Blessed are we if our year contains even a few of those experiences. May your year be so filled, Shimon! Oh, Linda, I expect to partake in the exact forms you have chosen. I’m excited about the new walk in Shakespeare, music, and art. Now please do not fail to write of your experiences. That is the way I plan to participate. Sort of a virtual reality via Linda at shoreacres. By the end of 2018, I expect to be smarter since you are such a great teacher. You might prod me to do a little first hand learning, who knows! I suspect that a few posts during the year may be related to these new disciplines, but honestly? I’m undertaking them not specifically for my blog, but simply for the pleasure of it all. Of course, there’s no telling what I’ll discover along the way and, if you haven’t noticed, when I find something that excites me, my first impulse is to share it. I’m still very much that first-grader who thinks Show and Tell is the best part of the school day, or at least in a tie with the reading circle. Part of the joy of a new year is the not-knowing: not knowing what we’ll experience, what we’ll learn, what we’ll witness. I’m more than pleased to know you’ll be around to share all your new experiences with me, just as I’ll share mine with you. Love Show and Tell. The more the merrier. That’s a commendable program for the new year. Happy learning! Learning can be an occasion for happiness, there’s no question about that. I smiled to see the phrase ein kleines Lied in the German. 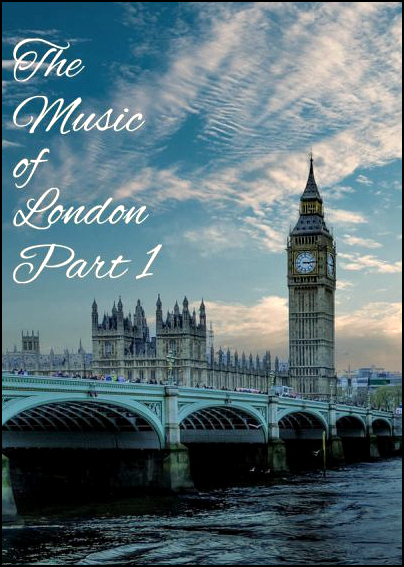 I went directly to Exploring Music and called up Eine kleine Nachtmusik, performed by the Academy of Ancient Music. The new year’s getting better by the hour. I’m half-way through a biography of Prokofiev, whose “Classical Symphony” pays tribute to Mozart and Haydn. Your projects for 2018 are admirable. And without a doubt we will benefit from your participation in said projects. I don’t have anything planned for 2018 but I intend to continue for as long as I can with my YouTube series featuring excerpts from works of New Zealand writers and poets. That series helps my speaking. As for reasonable words, I was hoping to use them in 2018 to calm some of my irritation over many troubled issues in the world. This morning, however, words, decent words, failed me when I saw the vilification of New Zealand and our young Lorde in the Washington Post. I am inclined to laugh when Trump harps on about fake news, but this incident and an earlier one in the Washington Post make me almost sympathetic to his point of view. Deep breath……. may peace be with you. I had no idea that you’re posting to a YouTube channel now. I knew you had posted a video or two, but I didn’t realize it was an ongoing project Did I miss a mention of it on your blog? That certainly is possible. I’m subscribed now, so I can enjoy the videos. I’m not sure whether YouTube provides notification of new postings when we subscribe, but I’ll explore that. When I first read “our young Lorde,” I thought you were talking about a member of the government: a “Lord.” Then, I remembered that she’s a young singer from your country. I had missed the flap over her concert in Israel. I suspect she’s getting as much pressure from the BDS movement as from other quarters. As in so many of these situations, individuals become pawns between opposing sides. Pleasing both simply won’t be possible. I have had the YouTube channel for awhile but I often neglect it for months on end. I see you have a channel, too, so I have subscribed in the hope that you may post again sometime. YouTube does send notifications but they are often slow in coming. My poetry and prose readings are supposed to happen each Monday and Tuesday. I try to keep them short and try not to fuss over them. I give myself one rehearsal, and two recording takes, if needed. My eventual plan is to move onto recording my mother’s story of her time in Fiji. That will require some photo research first. The program I used to make the slide show I posted isn’t available any longer, and I haven’t found a replacement. I suppose I could figure it out, but it’s pretty far down my list of things to do. Some day I’ll sort it out. Yes, losing that slide show creator put me off my video making stride. I’ll dig around as soon as I get some other things caught up and see what I can find. Give me a day to get back together, eh Linda? I do remember a few New Year’s Day mornings when I felt like he looks, but that was a long, long time ago. In fact, it’s been decades, and if I have anything to say about it, it never will happen again. Happy New Year! I think you have a good plan for the coming year. My reading will be of the sciency type. Surprised? Son gave me the Scott Kelly book about his Endurance of a year in space. Kelly autographed it to me. As for music, I will continue that. Last night we listened to the NY Philharmonic on TV do some West Side Story selections. Of course, writing will be part of my life. I can’t help it. I like coming here to your posts. You always have thoughtful things to say. It shifts my thoughts. The people who comment are interesting. It is a good crowd. I hope your new year is starting ok this morning. Ours had a bright moon shining in the windows across snow and -21˚ temps. I believe we have set a record for the date. Yippee! I’ve not read the Kelly book, but down here in Space City, I’ve heard nothing but good things about it. One friend gave it to a brother-in-law, who sat reading it at the Christmas dinner table. He was polite enough to put it in his lap, but they couldn’t get him to stop. It wasn’t very good manners, but it’s a heck of a recommendation. I love West Side Story and one of the best things I’ve ever seen is this studio clip with Bernstein at the podium. The interaction, the non-verbal communication, the sense of intimacy are beyond words. It’s a clip I watch on a regular basis, just to re-experience it, and to remember some of the lessons that are inherent in it. I always enjoy your input, Jim. I write about things that interest me, but I do try to vary topics, knowing that readers represent a broad spectrum of beliefs and interests. It always tickles me when someone says, “You know, I wasn’t at all interested in that, but you kept me reading.” Beyond that, the things I’ve learned from my own comment section would flll a book. Sometimes I think the comments are as interesting as the post, and maybe more so, but that’s just fine. We’ve still got high, thin cloud, so I don’t know what kind of moonrise we’re going to have. Right now, it’s 38F with a north wind at 17 kts, and there’s a kayaker outside my window with a flotilla of mallards following him. I suppose they think he has bread. I’ve listened to Kelly talk on various programs and watched specials about his experience. He is but one of a group of brave individuals who are true explorers. They are part of a long line of space pioneers. I’ve put Kelly’s book on my reading list, but when I went to our library’s website to reserve a copy, the wait is five weeks. That doesn’t make any difference to me, but it’s another sign of how well-received the book is. One thing I’m curious about: is the title, Endurance, a reference to Shackleton and his expedition? The Young People’s Concert series was great. When I was still in school, there was a similar series with local musicians in Des Moines, at the KRNT theater. I went with school groups a couple of times, and it was great fun. I did go out to see the moon tonight, but we were much warmer than you. I didn’t have any trees to shoot through, but there were clouds galore, and they added a bit to Mr. Moon. Oh that is a nice picture. The clouds were perfectly placed. Thanks for sharing it. I don’t know if Endurance was a reference to Shackleton or just to the long term stay. If I had to choose, it would be the latter. I guess we’ll find out when we read the book. The best job I ever had was working as a loading dock clerk. All I had to do was record the freight coming in and out – and business was slow. It gave me time to read and I read everything, from the classics to sci-fi. Insult tossers? I can’t wait. I hope it’s classier than what goes on with our social media, and I suspect it will be. Every now and then I take a peek at some Twitter timelines, just to see how things are going. Generally, the answer is, “Not well,” and I drop the curtain and back away. One of the things I’ve been pondering is why my exposure to Shakespeare in school never seemed to vary from one level to another. In junior high, high school, and even college, I remember reading the same sonnets and the same plays. Maybe I wasn’t paying attention, or perhaps the list of “acceptable” plays and sonnets was limited. My first response on peeking into The Oxford Shakespeare, 2nd Edition? I’m glad I’ve had my cataract surgery. That print is small! This sounds like an ambitious, yet admirable, way to spend a new year, Linda! You’re right in saying that what we focus on has a way of shaping us. By the way, Domer got me a copy of Annie Dillard’s book, and it packs a lot of wisdom in those few pages. I enjoyed it greatly … kind of like having an older, wiser mentor to validate my writing journey. Isn’t it funny how quotes get attributed to the wrong people and we keep perpetuating the errors? It’s occurred to me that our mothers offered similar advice when we were young. They cautioned us about hanging around with certain kids, saying, “You know that if you spend all your time with them, you’re going to start acting like them.” And they were right. I’m so glad you have The Writing Life. It’s been invaluable to me. Dillard was the first person I found who described something close to my writing process, and it was nice to find some validation for alternatives to the NaNoWriMo approach. After a couple of years of following Garson O’Toole, aka “The Quote Investigator” online, I bought his new book, titled Hemingway Didn’t Say That: The Truth Behind Familiar Quotations. Some reviewers have panned it, saying it’s too dry, and too much like a reference book, but that’s why I like it. If you don’t know his website, I think you’d enjoy it. Thanks, Linda — I’ll go check it out. The big problems with quotes you find in the net is that those quotes are often taken out of context. It’s due to laziness just looking for quotes and not researching the context. That’s a laziness I know from myself but from now on I don’t use a quote without knowing its context. But I have to admit I am not at all in favour of quotes. Why delegate your thinking and writing? Maybe the best New Year resolution would be not to delegate your thinking but try to think independently. Independent thought and a judicious use of quotations aren’t necessarily opposed. If a quotation can point a reader toward a richer resource, or expand a point, I think they’re perfectly acceptable. “Proof-texting” is another matter, as is padding an essay or article with another’s words, or searching for the “perfect” quotation to support a point. Those can be cheap tricks, used by lazy writers. But the words of certain authors have imprinted themselves on my mind, and never have left me. I draw on them regularly as sources of inspiration and insight, and enjoy sharing them. Why should any of us refuse incorporating others’ wisdom into our thought? Independent thought doesn’t require a refusal of history, after all. I suppose it’s a deeper understanding of history if one rephrases a quote in a way that it shows it’s historical background. As new year’s resolutions go, you’ve come up with a really good outline. The way you’ve laid out your thoughts and reasons for the plan, I once again applaud your ability to weave a story from seemingly random bits and pieces, and make the whole so like they had fit together in just that way. And the weaving sometimes takes place over a longer period of time than you might think. Some time ago, an out-of-town friend mentioned attending a music appreciation group. I was a little envious, so I snooped around and found one in the area that seemed interesting, but I couldn’t attend because it was during the work week. At that point, I went on the internet, and found Exploring Music. That’s the point when the Goethe quotation came to mind, and I realized it could provide a framework for a neat 2018 project. So here we are. I not only have my new year’s project, I managed to make a blog post from it. What could be better? I’m stopping here (very early on) to note that – as you are in the business of maintaining the beauty of wooden boats – I must admit my admiration (perhaps even a wee bit of envy) of such a delightful task! Actually, I’ve redone only two wholly wooden boats in my time. Down here, most wooden boats are small, and trailered, and live in fresh water. There are creatures living in salt water who eat wooden boats. It’s possible to have larger wooden boats, but there are all kinds of complexities, like the need to sheath them in fiberglass, or copper, or whatever’s used these days. The Elissa, the tall ship moored in Galveston, has an iron hull. My work is exterior trim — handrails, toe and caprails, transoms, and any other outside wood — as well as occasional inside jobs. It can be delightful work, especially in spring and fall. On the other hand, I’m not sure how delightful it’s going to be this week, with highs in the 40s. I can sand in that, but I can’t varnish below about 47-50F. With tomorrow’s high forecast to be 38F, I’m happy that I have some inside work, since most of my work is done on the docks and not in a shed. Come on down — you can help! I’m cautious when an author has one of his characters dispensing advice – – for example, I don’t think Shakespeare thought much of Polonius and his “neither a borrower nor a lender be…” spiel. But in this case, Goethe seems to mean exactly what he says, and this sounds like a first class plan. I’ve listened to McGlaughlin’s program on the Rochester NPR station, and love it when he talks about a key change, or a restatement of a theme, and then plays it on his piano, so you know what he’s talking about. He’s a great teacher, and his enthusiasm comes over the radio. I think the advice Goethe put in the mouth of Serlo is pretty Geotherian, too. But even if it weren’t, it’s still darned good advice. Actually, it sounds more like a polite suggestion, but “Taking Geothe’s Polite Suggestion To Heart” doesn’t quite make it as a title. I’ve always enjoyed McGlaughlin, but didn’t know that subscriptions were available until quite recently. It’s a good option for me, because I’m not always around to listen when the program airs, and being able to go back and listen at will is terrific. I’ve used Pandora, and still like it, but I use it differently, and mostly for other genres. As for Demon Internet, in the end it’s just a tool (or sometimes a toy). Figuring out how to put it to use effectively is the trick. I’ve certainly come a long way since the days of dialup, AOL, and dancing .gifs. I wonder how Goethe would categorize the Hampsterdance? Just listened to Elgar’s “Enigma Variations” on that program. I loved that piece the first time I heard it, when it was played in a production of Shaw’s “Heartbreak House”, and I’ve loved it every time since. Well said, Robert! I enjoyed your comment. That painting did seem dim and dark, and not quite what I’d expected when I read about the artist. I found another image that’s a little brighter. When I compared the two, it seemed as though the photo you linked to has been cropped, so the pronounced dimness may be due to the photo. I was intrigued to see that the Metropolitan Museum of Art held an exhibition of Ilsted, Hammershøi, and Vermeer in 2001. When I started looking for an image to use, I began with a search of Vermeer’s work. That didn’t turn up exactly what I wanted, but Ilsted’s paintings were interspersed among the Vermeers: quite naturally, I’d say. When I was trying to find other images of “The Coin Collector,” I ran into this article about a study for the painting that sold in 2011. 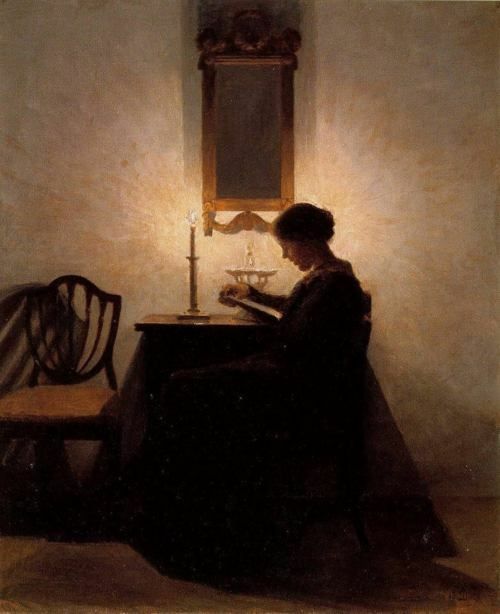 It turns out the model was Hammershøi’s brother. The article’s filled with interesting tidbits. I’ll read the article tonight, thank you! I saw that painting, and have a postcard of it on my desk. Because that doorway is given a lot of canvas, I figured there’d be a knock on it, any second, and a story would begin. Isn’t “garbage” subjective? On one hand, a computer saved my life (for certain) by giving me a life line to people who helped me survive a loss when I was physically isolated. But that was long ago and now the living of life on the computer has irreversibly damaged society and human beings themselves. I don’t think that’s overstatement. Re: Frog in boiling water. I know people who reject involving themselves with the daily “trivialities” of those less educated or inspired and they are sad examples of whole human beings. I think Walt Whitman did a fine job of gobbling up as much of everything he could possibly gobble and became a startlingly perfect human being. I’ve come to better live and understand my fellow beings by having lived and loved among some of the most desperately ignorant and daffy people I may ever know. Those experiences grounded me and showed me a way to a deeper, richer understanding and compassion. But I won’t deny being overwhelmed occasionally with regrets for lost time. I’ve lost ground, lost time educating myself to a more acceptable standard to please many people I have wanted to befriend. I simply wasn’t good enough for them. Those people… I have a dark spot for. And those “cultured” folk appalled by the plain speaking Whitman miss the discovery that Whitman’s writings are pure Upanishads. In the context of the programmer’s world, the “garbage” in the little aphorism is purely objective. I had to learn that lesson when I started using html on my blog. There isn’t any wiggle room. If you make a mistake, your page or your formatting is going to look entirely different: untidy at best, and incomprehensible at worst. I still don’t pay enough attention at times, and end up leaving a comment with errors like an unclosed italics tag or a broken link. It’s not hard to understand, but it requires attention to detail. In coding, it’s right, or it’s wrong. On the other hand, what you say about the role of computers in our lives is exactly right. Like any tool, they can be used for good or for ill. They can embed us into life in new and creative ways, or isolate us behind a screen. And, of course, they can be used to damage individuals or societies. But they aren’t living, sentient beings. We’re still the ones in control: or should be. As for lost time: which of us doesn’t regret that? No one captures that sense of bittersweet regret better than these guys. But I’ve developed the conviction over time that everything counts: even the errors and omissions. It’s all part of the fabric of life. Others have expressed the same thought over the years, far more eloquently. Whitman’s one, but there are others. Still, the New Year’s a reminder that we can put all that behind and move on — even if we’re limping a little. I’m glad it appealed to you, Michelle. I think I knew the quotation even before I knew it was associated with Goethe, and certainly before I knew it came from his novel. There’s a lot of wisdom in it — particularly since art, poetry, and music can be found almost everywhere. They don’t require concert halls or museums — thank goodness. You are so right-and I have taken that quote to heart! These are magnificent goals and intentions for the New Year and I applaud you! And, I will look forward to hearing what you discover from the Bard or the music and certainly your take on the art. The words you quote remind me of the Sondheim song from Into the Woods — “Careful the things you say, children will listen. Children will see, and learn.” We all absorb what we don’t consciously realize we are absorbing. Goethe (and his character) were wise. And so are you. I’ve not seen “Into The Woods,” but the song lyrics fit perfectly. Not only are we known by the company we keep, there’s always a temptation to become the company we keep. Whether it’s joining in office gossip or taunting on the playground, poor behavior always is easier when we’re with others who find it acceptable. Of course the opposite is true, too. The companionship of good people can help shape us into better people — perhaps even restraining us when “that” comment on social media or bit of political news finally puts us over the edge. “This English expression refers to little children overhearing and understanding more than their parents might think. The allusion is to the ear-like handles often found on smaller pitchers. But the same article said the phrase was used in Shakespeare’s Richard III about half a century later. I’ve got to get out my new Shakespeare book and find it! Wonderful goals (not resolutions) for the new year. Oddly, Husband and I attended a memorial service New Year’s Day for a friend that I have known since the 1980s and worked with at two different companies. She passed suddenly at 62 so it was a somber way to begin the new year as I reflect on the brevity and uncertainty of life. And I want to declutter my life and pare down to what is important. Art, literature and music are always important. Social trivia is less important. That’s a difficult and sobering way to begin a new year. It’s a reminder that nothing is guaranteed: not even the next day. The loss of a friend never is easy, but to lose someone so young, and lose her so unexpectedly, must have been especially hard. As for decluttering and paring down, I think it’s both hard and satisfying. No one needs eight quart casseroles; that’s easy. But sentimental objects? That’s something else — especially for someone as sentimental as me. Still, a little extra space always is good, whether in cupboards or in life. Here’s to a happy and satisfying new year. Happy year Linda. I know it will be better than last. I look forward to learning what you learn. I certainly hope it will be a better year than last, Kayti. We’ll cross our fingers that our health remains good, or improves; that natural disasters will be fewer; and that a few more reasonable words get spoken in the centers of power. Those words you quoted from Khan Academy are so true. We’re never too old to learn something new — thank goodness. Those are excellent plans for the new year! I myself plan to go to bed earlier & drink more water. Yours sound more edifying and FUN! More water’s on my agenda, too. I don’t have to worry about going to bed earlier, because I usually am ready to collapse at 10 p.m. anyway. But I’m looking forward to my new projects, and to rearranging my life a bit so I can do everything I want to do. By the way — tomorrow’s your big day! I hope everything goes well, and that by the end of the day everyone’s bowing down and hailing you as the best darned thing ever to happen to them. Have fun! A wonderful way to start the year, no matter where it takes you, in the end. Enjoy! As I (think I) mentioned, I did register for one of the Coursera classes you recommended. I think it would have been excellent for someone with more background and more time to dig into a specific area, but Exploring Music seems better suited to my needs just now. I certainly am looking forward to it all. I mentioned to someone that I’m glad I have my cataract surgery behind me. The print in The Oxford Shakespeare is tiny. That man wrote more words than I realized. Hello, Linda. Nothing could have driven home more firmly to me the realization of how intellectually lazy I’ve become than reading “Middlemarch” last year. By the time I had completed my journey through 800 pages of George Eliot’s brilliance, I was overwhelmed by a sense of how much time I have been wasting in the substandard when greatness is all around me. If that sounds hyperbolic, I apologize. But I am committed to do better on all fronts especially in what I read. Thank you for an inspirational post. I’m filled with admiration that you finished it. I have a friend who began Proust’s In Search Of Lost Time (aka Remembrance Of Things Past), but she finally collapsed under the weight of the project and never got beyond about the middle of the second volume. However, she said the experience was worthwhile for precisely the reason you point to — it reminded her that there could be enjoyment in the struggle with a text. I don’t think you’re being hyperbolic at all. It’s a fact that there’s greatness surrounding us, and there’s a good bit of trash. If someone wants to criticize us for preferring one over the other, so be it. Reading was my greatest pleasure as a child. I read early and widely, and had parents who encouraged me. In recent years, I’ve found that pleasure restored, and one of the things I’m looking forward to in the new year is the stack of books that awaits. I’m glad you’ll be joining me! There is something to be said about standing in front of the actual work of art, to being confronted with the actual painting the artist painted that has its on cachet, However, the artist’s aim is to confront us with a specific image; it is the reason for the creation of the work. So many works of art were created before there was no other way to be confronted with the image than to stand in front of the actual painting. Now that we have a vast world of art available to us — works we could never see in person, works that may be in private collections that are inaccessible to us — we can confront ourselves virtually with these images that the artist chose to show us. I applaud your plan to read Shakespeare and hear new music. There is a fortune in music, vast riches in the printed word out there just lying around just waiting for you to reach out and take it. You may remember that some years ago I won one of Gary Myers’s paintings in a naming competition. I still remember my astonishment when it arrived, and I was able to compare the actual painting with the images of it I’d seen online. The primary differences didn’t involve the colors, as they were very near to those I’d already seen. But the textures, the shape of the brushstrokes — all of those little tactile differences that convey the reality of a human hand at work — were suddenly visible. It’s certainly a reason not to depend solely on the internet for viewing art: although, as an introduction to new artists, or as a way to explore further those familiar to us, it certainly is valuable. It’s been a while since I’ve read Shakespeare. It’s going to take more discipline than I imagined, particularly since I find reading plays far less satisfying than seeing plays. Still, I’m only a day behind, and can catch up when the fog rolls in on Sunday. Now that is impressive! Starting the new year with Shakespeare. It has been a long time since I had such a literary challenge. I do want to use 2018 for learning… especially new skills such as playing the flute and qi gong. As long as we keep learning growing and evolving. Wishing you everything of the best for 2018! One reason I chose the Shakespeare-in-a-year approach is that I know myself well enough to know that if I decided to just “read a poem a day,” the effort to find new poems, pull together sources, and so on probably would become wearing by about February. This way, I still can explore other poets, but the formal outline will provide some structure, and that ought to make it easier. The writer and naturalist Annie Dillard once wrote, “A schedule is a net for catching days.” And so it is. I anticipate some good days showing up in the net in the coming year, and I wish the same for you! That’s such a fitting quotation, and quite true. And it seems to me that the phrase “any authentic creation” can be expanded to include creativity of many sorts. A parent teaching a child the tricks of cutting paper snowflakes, or the effort put into learning to bake bread, also can be authentic creation. It may be on a different level, but the impulse surely can be the same. Your ambitions humble me! All of those fields are ones I deeply care about, but where do you find the time? I make time for my reading every single day, listen to music at least on the weekends, and belong to a few museums to keep up with the art world. The New Yorker alone chews up hours of my evenings, and I’m still on October issues in my ever-growing stack! Throw in my own writing and work, plus daily chores, and I’m all out of time for more scholarly pursuits! Oh, time! It’s a problem, there’s no question about that. It certainly requires constant adjustment, and a level of flexibility that doesn’t come naturally. Thanks to my work as a varnisher, I’m far more flexible than I used to be, since my work’s weather dependent. If I get up in the morning and it’s foggy and wet, or raining, or 20F, it’s time to tend to the blog, or do laundry. If the sun suddenly appears on a Saturday or Sunday, everything else gets tossed overboard while I grab my camera, and hit the road. I laughed at your reference to The New Yorker. I still remember the day I confronted my own stack, which was far more substantial than yours. I took some current ones to my vet’s office, and tossed the rest into the trash. The sense of freedom was palpable. The nice thing about my little routine for this year is that it’s pleasurable, and won’t interfere with work or other daytime pursuits. Whether I can keep to it is another question entirely, but there have been years I’ve already broken a resolution or two by January 5, and this year I haven’t. So far, so good. I feel like someone will punish me if I throw away the stack of New Yorkers, but I have started to skim (don’t tell!). How inspiring, Linda. Truly, I haven’t had much time to think about ambitions for 2018. But I do remember thinking last autumn, after you had posted about the Monument Rocks in Kansas, that there was much of the central Midwest that I had not yet discovered. This year I will be driving up to Nebraska to see family for a graduation and a wedding, and I will make another trip to Chadron to visit a friend who is celebrating her 100th birthday. I want to make time to poke around and check out more of my native state and also Kansas and northern Oklahoma. Why not do a little exploring now that I have dependable wheels? I may not be planting gardens this year!! I didn’t know where Chadron is, and when I looked, I saw it was up in an area that interests me because of the various prairie preserves, grasslands, and so on. What I didn’t expect to see was the Nebraska National Forest. “Nebraska” and “forest” seem a strange combination, just as hearing about our piney woods seems strange to people who think Texas is all scrub land and tumbleweeds. I love that you used the phrase “make time.” I’ve recently started thinking about the difference between taking a photograph and making a photograph, and it’s occurred to me that the same distinction applies here. We often talk about “taking time” for this or that, but if we focus only on taking time, we often don’t find any time to take. On the other hand, “making” time suggests a more active approach — creating spaces in our lives for those things we want to do: like reading Shakespeare. One thing is certain. If you want to visit a friend who’s celebrating her hundredth birthday, you’d best not dally and say, “Oh, I’ll get up there later.” Anything can happen to any of us, but with that many years in the rear view mirror, the chance of a visit is going to get chancier! There’s nothing more fun than exploring, at least in my book. You’re a great explorer in your own little spot in the world — you’ll have great fun wherever you decide to let your wheels take you! ps: could you check and make sure my comment on your latest post didn’t land in spam? I’m having some WordPress problems. This post is relevant today. We have found that so many people–from young ones to folks our age–have left the intellectual life behind in order to follow the People Magazine model. Voyeuristic and mind-numbing, such focus leaves conversation banal and boring. I commend you for your aspirations. The Bard will not disappoint. How about reading all of Proust? Visiting museums, studying history, focusing on art and classical music? Alas, the Kardashians, FaceBook, etc. have lead many on a circuitous route to nowhere. Reading all of Proust? Probably not. On the other hand, despite my affection for the great “Madeleine” passage, by the time I get through Shakespeare, I may be ready to tackle more of Proust. Not the whole of the work, certainly, but perhaps a volume or two. Speaking of relevance, after reading as much as I could stand about the current best seller (which I’ve dubbed The Young and the Restless Go To Washington,) I’ve been tempted to skip to Titus Andronicus — but I’ll keep to the schedule. Are you planning to blog about Shakespeare? I would be piqued by your reactions to each of his works. I have taught a number of his plays to high school students but since most of my post-graduate focus was on American literature and of WG Sebald, I do not consider myself well-versed in the Bard. I have just finished the trilogy by Robert Harris on Cicero (splendid) and loved his story-telling and superb writing style so much, I have just downloaded Conclave, about the choosing of a new Pope. I’d never thought of “blogging about Shakespeare” and probably won’t, although I can’t guarantee this or that won’t creep in from time to time, particularly if there’s something in his work that relates to what I’m seeing or experiencing elsewhere. While you’ve been reading Cicero, I’ve been working my way through David Ferry’s translation of The Epistles of Horace. There’s at least one extensive passage about poetry I’ll not be able to keep to myself. Imagine Faulkner in a toga, declaiming to Annie Dillard, and you’ve got the feel, if not the words. The book (a bilingual edition) is splendid, and certainly belongs on that list of “gotta reads” you surely have somewhere. OK. I love reviews from people I respect. I will look for it. Love the Faulkner in a toga image. What a brilliant writer Faulkner was. Probably America’s best. Wishing you all the best in 2018, Linda. May all good things come your way! Thank you, Lavinia. Here we are, already six days in, and it feels like the days are spinning away. Let’s make them all count! Look at you, making resolutions or “commitments.” And what lovely commitments they are. It’s refreshing to see someone making enjoyable commitments instead of the torturous kind: lose weight, exercise, etc. I appreciate the quote, “Be selective in choosing those to whom you listen, because their voices will influence your own.” How true that is, and nowadays we can find voices that are tailored to what we already believe. We don’t have to challenge ourselves or stretch one bit if we don’t want to. I know you will enjoy your pursuits in 2018!!! Happy New Year!!! I’ve got some of my own more usual resolutions, and a few other goals, but I really wanted something that could carry through the year, and this seemed perfect. Your point about choosing voices that only support what we believe is important. That’s part of the reason various divides in this country seem to be widening. It’s also a reminder of something that got me started on this Shakespeare bit. Various professors at Cambridge and other universities were issuing “trigger warnings” for parts of Shakespeare’s work, or refusing to assign plays that might distress their students. I can’t do anything about the curricula at Cambridge, but I sure can read Shakespeare, distressing or not. I like to think of it as joining a different sort of resistance. Happy New Year to you, Bella. I hope your holidays were relaxing and enjoyable — and healthy! I join you in your resistance (emotionally, though not necessarily by rereading Shakespeare). This business of constantly being on our toes so as not to offend others endangers free communication, and is an insult to art and culture. To be frank, government censorship seems the least of our problems today: at least, in this country. Censorship by violence and threat of violence is a nasty reality on many campuses, and self-censorship is an acknowledged reality. Many in corporate or academic life have written about their reluctance to disagree with “approved” positions, and the effect is stultifying. Institutions of higher learning that were admired for their commitment to free speech and diversity of opinion fifty years ago are among the most illiberal now. Demands for conformity and proper thought are what they are, whether they come from the right or the left. Who needs to burn a book, when you can redefine words to suit your preferences? That is exactly what I was referring to. Government censorship is unusual today in democratic countries. But this notion of politically correct, which I thought at first was a joke, has become more pervasive, and I find it obnoxious. Even in Hebrew, which is a very direct language, there are those who try to push this sort of censorship. I resist. I agree with you. It doesn’t seem to be right or left. Though even defining things as right or left sometimes blurs the question. Beautiful and thought-provoking post, Linda… inspiring as well! “garbage in, garbage out.’ gave me a little chuckle – yes you are so right, and after reading a beautiful section of prose, it’s always a joy to savor the words and appreciate the mind and soul of the person who gifted us those jewels. Your posts are a gift to us! Here’s to a new year filled with non-garbage: reasonable words, resonant paintings, and beautiful photos of a beautiful world. They’re the best way to convince others to forgo garbage. Same back to you, dear Linda! First of all, thank you for this beautiful and inspiring post, Linda. The conversation here is amazing and a true gift to us. You expose the beauty around us. A New Year brings the magic of new beginnings and wonderful opportunities and your goals sounds awesome. We wish you a healthy, happy and prosperous 2018 filled with joyful studies. A new year always feels limitless to me, Dina. The temptation is to take on too much: to set unrealistic goals that guarantee failure. But a little music, a little poetry, and a little art? Of course that’s do-able, and I’m looking forward to the unexpected discoveries that surely will accompany my explorations. One of the things I’ve already discovered is that difficult text slows me down; it forces me to go back, re-read, and reconsider. Sometimes, I’ve had to take a paragraph of text line by line until the meaning becomes clear. With that kind of practice, this may become the year I finally understand Lightroom. Transferable skills are the best! I like your idea (and this of the Weimar classic) of reading something ‘decent’ every day. But may I play the advocatus diaboli? Reading every day is like a kind of consumerism, I would call it CC culture consumerism. After one has read a book I think it is basic to take some time to think about it and keep a diary about your reading. That refers to every perception of art, I suppose. One should be aware why do I consume art. Anyway reading one book after the other, visiting one museum after the other may strengthen the ego but for one’s education it does not much. It would be wise to promise oneself to keep a diary about one’s reflections about every artifact one has perceived. Of course I think about what I read, not to mention what I experience in the world around me. Given the nature of my work — solitary, simple, physical labor for many hours each day — I have as much or more time to think as anyone I know. The thought of keeping a personal diary seems tedious to me, but I suppose in a sense this blog is my diary, since thought and reflection are second nature to me and I record my conclusions here. The need for reflection is part of the reason I never write about my travels until I’ve returned home and had time to consider my experiences. Sometimes, the writing doesn’t come for months or years. In The Alexandria Quartet, Lawrence Durrell has his character Pursewarden say that it’s the task of the novelist to “rework reality to show its significant side,” and that reworking takes time: not only for the novelist, but also for the poet, essayist, or blogger. First of all thanks for your answer and thanks for mentioning “The Alexandria Quartett” books I really like. And getting back to the Weimar classic. I. Kant once wrote on the door to the lecture room: Can’t come have not come to an end with my thinking. You see that were different times with different lifestyles of intellectuals like Goethe, Herder, Schiller and Co. Or did you ever come across a professor today who said or wrote what Kant did? That’s quite a project you’ve taken on, I’ll be fascinated I’m sure with what you write as a result of it all. My plan this year, is poetry based. More of Mary Oliver, more Rumi, finally Walt Whitman, and Hafiz. And a couple of additions to the photography gear….. which once the weather is less an oven, I’ll get out and play with some more. I’ve developed a sense that this little project is akin to a trip through the Outback, or the Great Dismal Swamp. You start out with a few expectations and the best preparation you can muster, but there’s no question there will be unexpected experiences and equally unexpected detours. Whether I’ll write directly about any of it is uncertain; I’ll be as interested as anyone to see how things work out. I’m looking forward particularly to your sharing of Mary Oliver and Rumi. It will be interesting to see what you choose from Whitman. I’ve had his poem about the astronomer in my files for some time. Maybe this will be the year I finally include that. I saw that Syndey reached 47C. I believe it was a record, but if it wasn’t, it’s still oven-like, and not conducive to getting out to play. I hope things become more reasonable, soon. Wishing you a fabulous year ahead Linda! A fulfilling year of poetry, music, literature, art, good health and good cheer! Thank you, rethy. It’s certainly moving along; it’s hard to imagine that it’s already January 8. If I don’t get busy with projects left over from 2017, it’s going to be 2019. Maybe if I waited until 2020 (!) I could see my way clear to getting them done more efficiently, but I don’t think that kind of dallying would be wise. A happy year to you, too! How wonderful! I remember what a delight it was to move from my old computer with a CRT monitor, to a flat screen, and then to a larger flat screen. Now that I have an iPad, and have seen what the better screen resolution can do — well, perhaps I’ll save my pennies. A new year and fun, new projects complement one another so well. Enjoy your explorations, just as we’ll enjoy hearing about them from time to time! I totally agree with Serlo – and you – that we all could do well by setting time aside for music, literature, and art every day. And I think I do, more than anything listening to music and reading. Enjoy your three commitments for this year! If nothing else, the music, reading, and art provide some relief from other, more demanding projects: like learning photoshop. But winter is a good time to start. There are long evenings and inclement weather — setting the routine before spring starts enticing us all outdoors probably is wise! Wow, what a wondrous plan for the New Year! I find I use art more and more in class. Theology is enhanced, I think, as the right side of the brain opens up an imagination that plays with rather than is stifled by rationality. I suspect you will find yourself well compensated for your resolutions this year! I’m sure your students profit from your use of art, just as I profited from my professor’s use of literature. Annie Dillard once wrote, “Appealing workplaces are to be avoided. One wants a room with no view, so imagination can meet memory in the dark.” Personally, I like my view, but I take her point. It’s also true that imagination meeting rationality “in the dark” can lead to marvelous insights. I suspect the “dark night of the soul” so often referenced by the mystics is an example of that experience. I’ve fallen a little off my schedule recently, but it’s still an enjoyable discipline. I wasn’t sure it would be, but I’m not inclined to drop it. I thought the painting was perfect as an image. It’s got a peaceful, soothing feel to it.